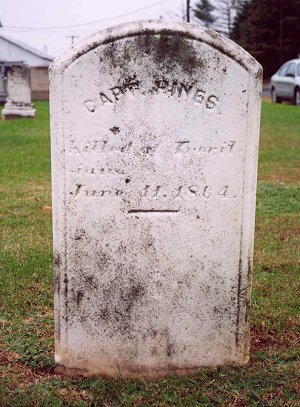 John P. Hines enlisted April 3, 1862 in Bryan County with Capt. J.L. McAllister. Hines was commissioned Captain of Co. B of the Hardwick Mounted Rifles on April 1, 1863. He was with the HMR until, through consolidation of units, he was transferred to Co. H, 7th Regiment, Georgia Cavalry. As Captain of Company there were responsibilities such as having to maintain the needs of the horses, men and the camp. One example: For the month of April and again in May, Capt. Hines requisitioned forage for the 77 horses that he had in Co. H, May 1864. On June 11, 1864, Capt. John P. Hines was killed in action near Trevillian Station, Va.